We travelled to Alaska to photograph Sheryl and Rob's destination wedding. They both lived there and wanted some amazing photography. Neal Urban Studio was the way to go! 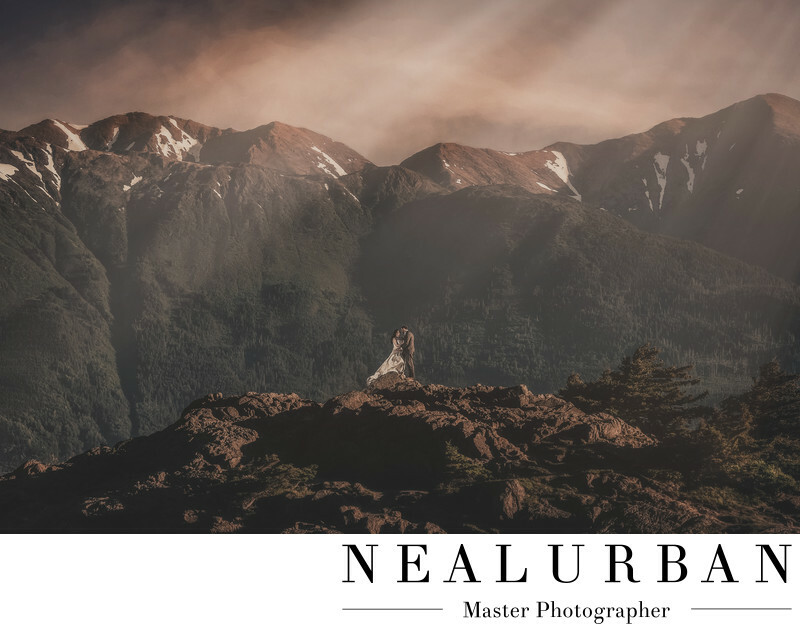 We were in Alaska for a week to document, not only the wedding, but multiple photo shoots for the bride and groom! The ceremony and reception were at Settler's Bay Lodge in Wasilla, Alaska. The following day, we all jumped in our cars and took the Seward Highway for a day trip to Seward for photos. On the way down, Neal and I mapped out some locations we wanted to stop at on the way back for photos. Lighting was not the best at that time. The drive back would be better. Sheryl and Rob packed the wedding dress and tux as well! This was taken at Beluga Point. This was the first location we saw on the drive and knew it was going to be amazing to stop at later in the day. Neal planned out this image the entire drive down. We needed Sheryl and Rob to stand on this mountain. You had to cross over the beach and climb up. What he failed to mention was I would be going up as well for lighting. Great! I do not like heights. But the bride said it would be no problem! She had her hiking boots on under her dress and helped me up with the gear. She mentioned her and her husband love to hike, so this was a piece of cake! To get this image Neal was standing so far away to capture the whole area. He was in the parking lot and we could hardly see him. We were in contact through our cell phones! Good thing we had reception! The sun was setting and the mountains in the back ground were lighting up. We loved how you could see a little of the snow on the mountains too. It was so crazy. The temperature was about 65 degrees where we were. Then you see snow! This was an amazing destination wedding and one place that was on Neal's bucket list to photograph! Location: Beluga Point, Seward Highway, Anchorage Alaska, United States.